A few days ago I returned from a 67 day trip around the world. In total, I hit 18 countries. This might sound like a big deal to many people, but to me its business as usual. Since I left the corporate world and focused my efforts on building my own businesses, I’ve been able to enjoy an extensive amount of freedom. I’ve taken advantage of this and have been able to enjoy international travel every year, sometimes more than once a year. Seeing the world and experiencing new cultures, languages, foods and cities is a big passion of mine. I literally feel like I have been able to live the lifestyle of a millionaire! I have an inside joke with one of my business partners: we call each other multi-millionaires and multi-billionaires — its silly, and we laugh about it, but in reality, we both have the freedom to do pretty much anything we want in life, due to our unique work situations. This trip was different from the ones I’ve done in the past… this time I traveled around the entire planet instead of coming home after hitting one continent/destination. I’ve always wanted to circumnavigate the world and I can finally check that off of my list! Thanks to my internet based businesses, I have been able to live my life with a high level of flexibility in terms of when and where I work and play. With the current modern day technology we enjoy, now is probably the best time in the history of the world to be an entrepreneur! Over the past weeks, I’ve had many people ask me: “Mike, how are you doing that? What kind of job do you have that you can travel like that?” I want to say to any of you who might be reading this that seek the same lifestyle setup that I have been enjoying for the past 5-6 years… it is completely possible. Yes, it will require a lot of time and effort to get over the initial hurdles to leave your job and start and grow an internet based business, but in the end it is definitely worth it. You can have it all – just act now and don’t defer your happiness to the future! Many people along the way have questioned my life choices and only focused on the negatives about leaving my old career (management consulting) or home for long periods of time and “missing out” on things that were important to them. The bottom line is that you are the only person that can make decisions in your life to be happy. Decide what you want, and go for it. Stop thinking so much and act! I encourage you to take some concrete steps towards what you want in life! Forget the concept of retirement and the rest of the deferred-life plan—there is no need to wait to enjoy life. Whether your dream is escaping your dead end job, world travel, or just living more and working less, getting started with your own business is really the way to go. At this point, I can’t imagine myself doing anything else. The thought of going back to corporate America to work as an “employee” to grow someone else’s bottom line just doesn’t sound appealing in the least to me. Traveling internationally has really opened my eyes. In many ways, we live in a cultural bubble here in the states. Yes, the USA is an amazing country, but there is a lot we can learn from the way people live and the way things are done in other places around the world. Experiencing new places and ways of life is both an educational experience and a pleasurable one. Despite meeting up with friends and business partners on my trip, I did spend a good amount of time traveling solo. I’ve found that making new friends is easy in nearly any culture/environment, even more so if you travel alone because you are forced to talk to people! If you are friendly, genuine and charming, making friends with people from every culture and background is possible. Once you make these new friends, you can learn a whole lot about the world from the other person’s vantage point. Another way traveling has opened my eyes is that it has taught me to not take anything for granted. You don’t know what you’ve got ’till its gone! Just off the top of my head, I have gained a newfound appreciation for space. Here in the states, we really live in luxury in terms of the amount of space we have in our homes and apartments. In most places I’ve been on my trip, people live in small, cramped living quarters — but they make it work and are used to it. When I returned back to my house here in California, my eyes really opened and I realized how luxurious my place really was! While traveling is a ton of fun, there are a couple drawbacks! One of my primary complaints about traveling as an internet marketer has been lack of access to wifi and a proper workstation — desk, nice office chair, large external monitors and even simple peripherals like a printer. Moving around constantly limited my ability to get a solid amount of “work” done. Yea, I have a great laptop and everything but its really not the same when you aren’t in your natural office environment. Despite all of this, I was able to get the basics done and keep things functioning. Another issue I found has been that I totally lost my workout routine and clean diet streak. A big part of traveling is trying new food and drinking a lot of alcohol. After over 2 months on the road, I have to say I lost a lot of the progress I saw in my fitness level – not being able to play basketball or lift weights frequently really took a toll on my strength and body composition! A big part of it is due to the completely irregular meal frequency and volume of delicious food and drink I enjoyed on the road! Yea, I probably could have worked out more by doing body weight workouts in my hotel rooms and etc, but its just not the same as the routine I have back in California. Berlin, Germany – A nice city with a vibrant nightlife scene among young people, great food and beer, internet not so great surprisingly, efficient transport system — lots to see here! Budapest, Hungary – Once again, gorgeous women and incredible architecture. Breathtaking city, really. I will definitely return here someday. Rome, Italy – Already been here several times in the past, but never stop enjoying this place. Incredible basilicas and churches, architecture, passionate people, and great food! Amalfi Coast, Italy – Very beautiful coastline with winding roads high above the ocean. Absolutely delicious food everywhere. A bit expensive but well worth a visit at least once in your life. Positano, Italy – One of the most beautiful places on the planet – high end vacation spot. Spent over a week here. The water was really clean and warm. Just look up some photos on google and you’ll see what I mean. Pompeii, Italy – Always wanted to check this place out since I learned about it in elementary school. Vatican City State – Home to the most beautiful basilica and piazza on the planet. All designed by Michelangelo. Brussels, Belgium – A beautiful, diverse city with excellent food and friendly people. I was surprised to learn that everyone speaks French here. 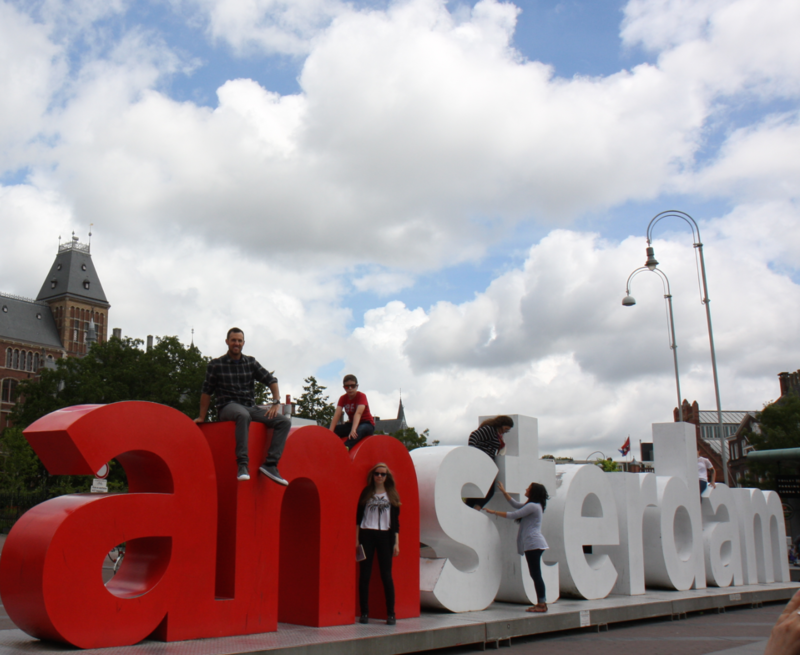 Amsterdam, Netherlands – Stunning little city with canals all over, tons of places to eat and drink, lots of people partying everywhere, amazing parks, great food, inexpensive, thousands of people on bikes. I want to move here someday! Antwerp, Belgium – Sort of just passed through this place but it was very nice. Paris, France – One of the most beautiful cities in Europe. Great food and views. Very expensive place to visit! Lisbon, Portugal – Portugal is really underrated. Some of the freshest and best food I had in Europe. Very beautiful monasteries, churches and monuments all around. Great nightlife scene. Very cheap!!!! Nazare, Portugal – A stunning coastline home to some of the largest waves ever ridden by man. Great seafood here! Fatima, Portugal – A pilgrimage spot I’ve always wanted to visit. If you are Catholic this is a must see! Barcelona, Spain – Tons of stuff to see here. Great churches that are not really churches anymore since you have to “pay” to go inside. A bit run-down and not what I expected but I am glad I visited this place. Great food and nightlife. Bangkok, Thailand – Bangkok is pretty amazing. Its a slum but at the same time a sophisticated city. Very friendly people, lots of scammers trying to get your money, awesome shopping and food, great nightlife. Bangkok is crackin’ 247! Hong Kong SAR – One of my favorite cities on the planet. I’ve been here maybe 10 times before this trip. Incredible architecture, infrastructure, and public transport. Most free economy on the planet. Food is insanely good! Nightlife is awesome. Macau SAR – Small place, this is the Vegas of Asia. Tons of cash coming in here from wealthy mainland Chinese people. Resorts/casinos here are incredible. Food was VERY good and not too expensive. Seoul, South Korea – I decided to visit Korea before returning to the States, and what a great idea it was. This was my first time in Korea. Its really a fascinating place that is alive 247. Much more affordable than I thought it would be. Japan-level efficiency/technology/hospitality but 1/5th the price! Food was very very very good, nightlife was awesome, shopping paradise. I may want to move here someday! Drank alcohol in public – yes, this is crazy because its basically illegal everywhere in the United States and legal everywhere else in the world. Shocker! Drank some incredible beer in Austria – an amazing place! Was cool to see the stomping grounds of one of my favorite composers (Mozart). Met with many of my best friends and business partners from around the world who hosted me and/or travelled to Europe to meet up! Partied at Lan Kwai Fong (LKF), Hong Kong’s nightlife district with hundreds of bars and clubs — one of the best places to party on the planet (my personal opinion)! Visited Seoul, South Korea – their display of efficiency, infrastructure and cuisine is second to none! – Great nightlife scene there as well. The Samsung HQ was REALLY impressive. They are coming out with some great new products! I’ll be posting some photos of my trip here soon. I decided to take my Canon DSLR along with me and I literally took thousands of photos, so theres a lot to go through and it will take some time! Bear with me. In the meantime, add me on instagram.com/banana_ads to see some pics that I’ve already put up. I did lose my iphone in Germany so theres a few weeks where I wasn’t posting anything.